TestingWhiz, a test automation tool developed by Cygnet Infotech, has been selected as the Product of the Month by SiliconIndia Magazine. SiliconIndia is one of the leading technology magazines in India with a network of over 5 million Indian professionals and is one of the most popular sources of news and information on the Indian IT industry. The magazine is renowned as the biggest producer of tech news in India, and its team of experienced professionals have the ability to sniff out the most promising IT news, projects and products. 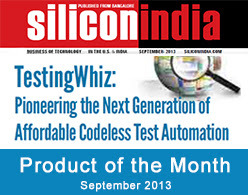 SiliconIndia awarded the Product of the Month title to TestingWhiz™ due to its time-saving features that speed up and simplify automated testing, and due to the growing popularity of the product locally and internationally. The tool offers great value to businesses as well as testers by speeding up the testing process by as much as five times, and by removing most common manual errors through automation.